The two largest global brands of capsule coffee, Nespresso and Keurig, are regarded by many as environmental nightmares. Billions of the throwaway nonrecyclable plastic products currently clutter waste dumps, waterways and city streets. Both inventor of the "K-cups" John Sylvan and former Nespresso CEO Jean-Paul Gaillard have publicly bemoaned the environmental consequences of the products they once championed. Sylvan has stated that the disposable (but not biodegradable) coffee capsule is "like a cigarette for coffee, a single-serve delivery mechanism for an addictive substance." As a postdoctoral researcher at the Center for Tobacco Control Research and Education at the University of California, San Francisco with a background in environmental philosophy and public health, I became curious how the waste stream of e-cigarettes has passed completely outside the regulatory radar. San Francisco's Pax Labs, maker of the market-leading electronic cigarette (e-cigarette) Juul, thinks of its product as a "Nespresso machine, if Nespresso still made great coffee." It also describes its e-cigarette as a "gun." While the health outcomes for e-cigarette vapor versus an inveterate capsule coffee drinker vary greatly, both "disruptive" products present lingering harms to the environment greater than the products they replace. The legacy of cigarette butts imparts a dark story. An estimated two-thirds of cigarette butts are littered, clogging sewer drains, blighting city parks and contributing to estimated cleanup costs of US$11 billion yearly for U.S. litter alone. Cigarettes are environmentally irresponsible by design, and yet e-cigarettes pose an environmental threat of considerable proportions. Instead of merely being thrown away, these complex devices present simultaneously a biohazard risk with potential high quantities of leftover or residual nicotine and an environmental health threat as littered electronic waste. Their endocrine-disrupting plastics, lithium ion batteries and electronic circuit boards require disassembly, sorting and proper further recycling and disposal. Their instructions do not say anything about disposal. Electronic waste (e-waste) already presents a daunting environmental quandary and is notoriously difficult to recycle. When littered, broken devices can leach metals, battery acid and nicotine into the local environment and urban landscape. A main question public health regulators must face is: How are these new devices being disposed of? Are e-cigarettes being thrown away carelessly, like cigarette butts? Or disposed of in special electronic waste facilities, like smartphones? Preliminary results from litter pickups give mixed results. 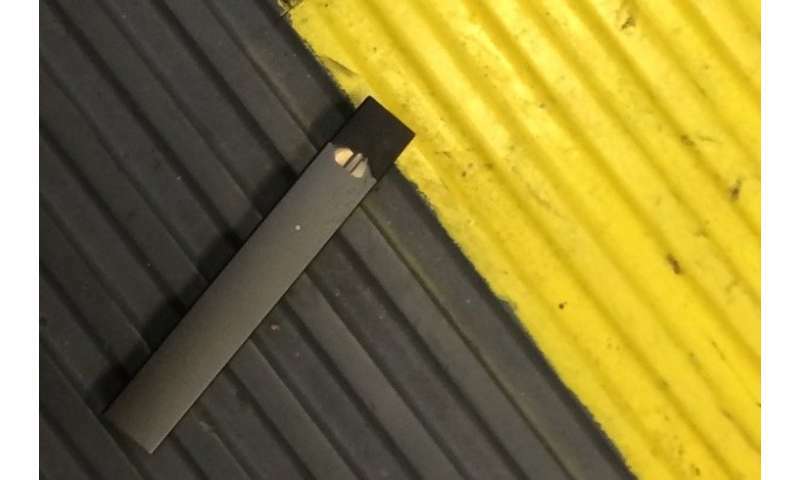 Juul pods are found routinely littered, especially where young people congregate. But because of the double-bind of e-cigarette waste being both electronic waste due to the components and hazardous waste due to the nicotine liquid residue, currently there is no legal way to recycle them in the U.S. The Office on Smoking and Health and the EPA need to coordinate their regulations to allow for the safe recycling and waste minimization of these products. The major transnational tobacco companies so far primarily sell throwaway, one-use "closed" system products. Vuse and MarkTen, owned by Reynolds American and Altria, respectively, are two leading U.S. e-cigarettes, and both are closed systems. While these products may prevent nicotine poisoning in small children, their environmental health harms may be significantly larger due to their expendable design. Most independent vaporizer manufacturers sell open, or reusable, systems, which are more popular with longer-term users and possibly more effective to quit than traditional cigarettes. In other markets, however, like the U.K. and Japan, transnational tobacco companies British American Tobacco (BAT) and Japan Tobacco International have begun to heavily market open systems. BAT's website on the disposal of their Vype e-cigarette warns "electrical waste and electronic equipment can contain hazardous substances which, if not treated properly, could lead to damage to the environment and human health." So neither open nor closed systems are environmentally sustainable. The World Health Organization, in its report Tobacco and Its Environmental Impact: An Overview, recently noted the "quieter but shockingly widespread impacts of tobacco from an environmental perspective." Article 18 of the WHO Framework Convention on Tobacco Control states that all signatory parties "agree to have due regard to the protection of the environment and the health of persons in relation to the environment in respect of tobacco cultivation and manufacture within their respective territories." It is time to close the loop and pay increased attention to tobacco product disposal as well. The mounting environmental impact of the single-use nonrecyclable coffee fad has left coffee capsule Keurig inventor John Sylvan regretting his invention. Will apocryphal e-cigarette inventor Hon Lik ever have a similar reckoning regarding the mountains of e-cigarette e-waste? Let's hope it never gets to that point.